Faye has been in love with the Bell Rattle for about a month now. The size is perfect for her tiny hand, it’s easy to hold, and the sound it makes is quite lovely. At four months, she was working on purposeful grasping and this was a great toy with which to practice. At a week shy of 5 months, she still chooses this rattle over all the others. It’s quite safe to chew on which is great since she gums up that metal like no other toy. I think the cool temperature of the metal helps calm her teething pain. This is a toy that could easily be introduced at 2 months, teaching the child how its movements can influence sound. Using a saw, cut a ⅜” hardwood dowel 4” long. Lightly sand the length of the dowel. Sand the ends so they are flat across and beveled on the sides. Wipe the entire thing clean with a damp paper towel and let dry. If you choose to stain your rattle with a natural coloring like turmeric or beet root powder, do that now. Seal with an all natural sealant. Take one of the eye hooks and burrow it half way into the center of one end of the dowel by turning it slowly with your fingers. Remove the eye hook by turning it slowly in the opposite direction. Do this to the other side of the dowel. 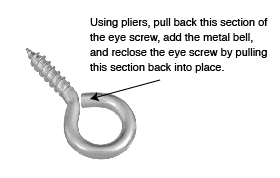 Using the pliers, pull back the open end of the eye, thread the metal bell onto the eye hook (with your fingers), and then–using the pliers again–close the eye hook. Turn the eye hook into the hole as far down as it will go so that a bit of the hook is embedded in the wood. Clean the excess wood glue off with a damp q-tip. Repeat steps 7 & 8 on the other side. Let dry for 24 hrs. Over low heat melt 1 part beeswax to 4 parts olive oil, careful that it doesn’t smoke. Stir. Remove from heat, pour into a jar, and let cool stirring occasionally so the oil and beeswax do not separate. Apply sealant to wood in a thin layer with a paper towel or disposable cloth. Thank you for the instructions. 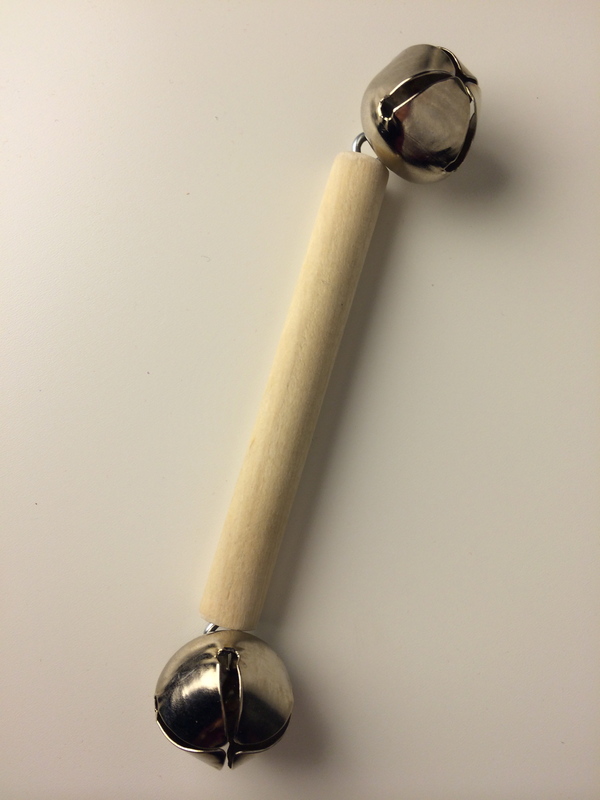 How do you introduce the bell rattle. Do you put the rattle in their hands or show it to them and leave it out. Waiting for them to grab it. You’re welcome, Erika! At a little over 7 1/2 months, the bell rattle is still a go-to toy for Faye. It has been a lifesaver during difficult teething days. The screw eye hooks that I think you used and seem to be the best are size 17/32″ – there is actually a size smaller than that but they are not sturdy enough. 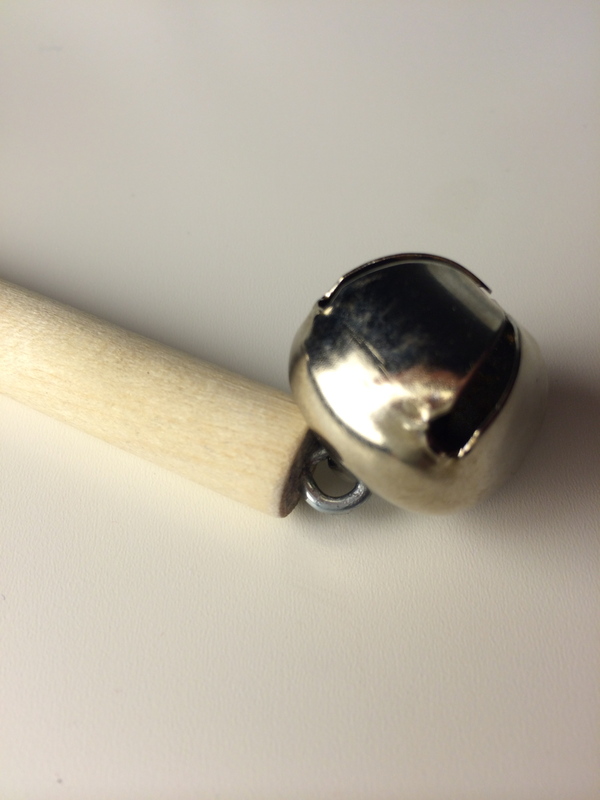 Also, the size of the bells- 1″ seem to be too big. I used .875 in. and it looks like all other bell rattles are made with this size. 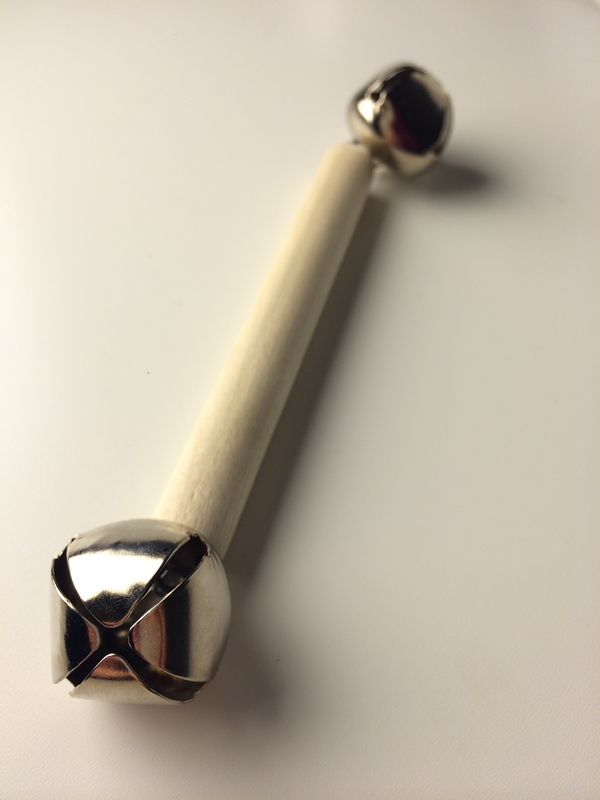 I made one rattle at 4″ and one at 3″ – my daughter is 2 1/2 months and the 4″ seemed really long for her. And I think the dowel could be a little thicker. I am going to play around with the thickness because they are so cheap to make.